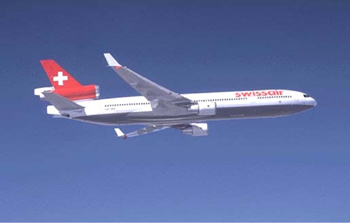 Swissair Flight SR 111, a Boeing (formerly McDonnell Douglas) MD-11, departed John F. Kennedy Airport (JFK) in Jamaica, New York, en route to Geneva, Switzerland. While passing through Canadian airspace, an in-flight fire ensued in the area above the flight deck ceiling, causing loss or malfunction of numerous airplane systems and instruments. As the fire progressed, electronic navigation equipment and communications radios stopped operating, leaving the pilots with no accurate means of establishing their geographic position, navigating, or communicating with air traffic control. The airplane crashed into the Atlantic Ocean near Peggy's Cove, Nova Scotia, while attempting an emergency descent and approach into Halifax, approximately 1 hour and 13 minutes after departure from New York. All 215 passengers and 14 crew members were lost. The accident was investigated by the Transportation Safety Board of Canada (TSB). The TSB concluded that an arcing event from an electrical wire associated with an in-flight entertainment system that had been installed via an FAA approved supplemental type certificate was likely associated with the fire initiation event. However, the TSB report stated that it could not be determined whether the arced wire was the lead event. The TSB found that once the fire had started, the thermal/acoustic insulation material installed in the airplane had a propensity to continue burning.